When I was young I wasted all my money playing street fighter and beat them up games no wonder my family game me my first nintendo, anyway super tired, I’ve been doing a lot of stuff offline and I want to make more comics perhaps I should learn how to make the kage no bunshin jutsu (clones are out of the questions, shadow clones dissapear after a while and clones stay so I have to feed them. This entry was posted on Friday, March 15th, 2019 at 5:01 pm and is filed under Uncategorized. You can follow any responses to this entry through the RSS 2.0 feed. You can leave a response, or trackback from your own site. I’m not exactly sure how to fix that last panel, you basically left out a lot of words. like “the ultimate goal of any arcade is to get as much money as possible from players” but then you’d have to shrink the text to fit that box. Espanol must be more efficient with space.. I am of an age to remember when the first *true* quarter-sucking game, “Gauntlet” came out. 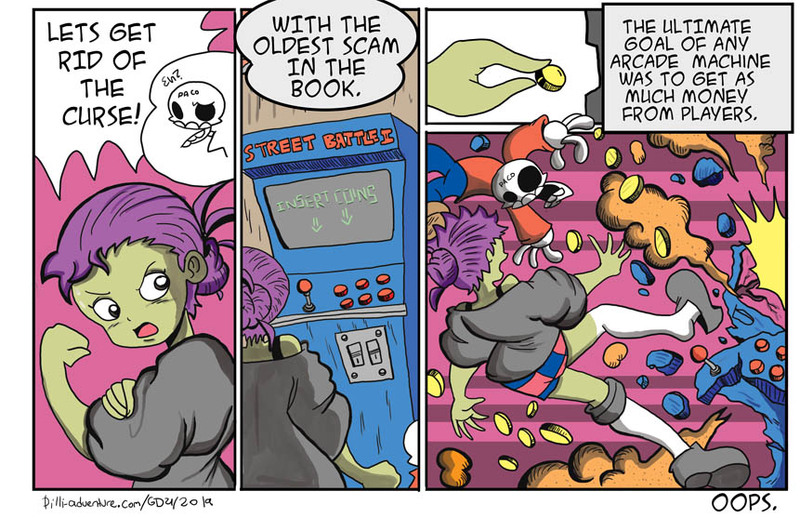 It changed the coin-op industry, going from whole “lives” to a steadily-decreasing health countdown. If you get far enough fast enough, you get in-game food to keep going… WIZARD, YOUR LIFE FORCE IS RUNNING OUT! WARRIOR IS ABOUT TO DIE! ELF NEEDS FOOD, BADLY! VALKYRIE HAS EATEN ALL THE FOOD LATELY! EAT YOUR FOOD, DON’T SHOOT IT!